Over a thousand years ago, they came to conquer, they came to persecute, they came to destroy or oppress almost every aspect of our ancestral heritage. Their goal was to establish the supremacy of the Catholic order and the Roman Empire. Towards this aim, they painted the lands of our people red with blood. We read the historic accounts of how our ancestors defied and rebelled against them in the name of their Gods and Goddesses. We all know the stories, we’ve all heard the accounts, which play a big role in why we are working diligently to rebuild what was lost so long ago. However, I wonder if the passion for this work and anger towards the legacy of the church has blinded some into thinking that our beliefs represent something they actually do not. Our goals have to be focused on the positive, and should never be based on vengeance or hate towards anyone, for this will only harm us and what we seek to achieve. Are these quotes from the Bible? The book of Matthew? Mark? Something from the Old Testament? Maybe from the Koran? Actually, they are from the Rigveda (hymns VII. LXXXVI.5, VII. XCIII.7X.CXXXVII.1), and there are several others just like them. As you may know, the Vedas are sacred texts written by our ancient ancestors. As the early Vedic religion evolved in Hinduism, the Vedas remained as their sacred texts and it is great good fortune that these wonderful writings were preserved. They often demonstrate an ancient Indo-European connection with Odinism, completely void of Christian taint. Not simply offshoots of each other, Odinism and Hinduism are separate cultural evolutions of the same faith, which existed millennia ago in what is called the Proto-Indo-European era. To prove how closely related the two religions are one only needs to look at the name of the Hindu god of wind, Vata (also Vayo), which is identical to the Germanic Wotan, Old Norse Odin. The name for their goddess of the Dawn, Usas, is the same as our Ostara. These names are not merely related, not similar, they are identical; they are but variations of the same words. 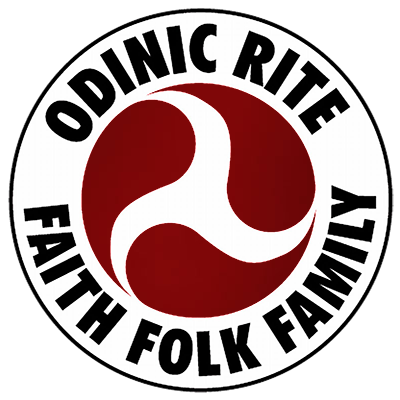 One thing that I am extremely proud of as a Folkish Odinist is that we accept our faith on its own terms, rather than try to make it into something that it is not. We reject attempts made by Marxists to turn it into some politically correct Universalist nonsense, as well as those made by white supremacists to use it as a front for their bigotry. Our religion is an ancient ethnic heritage, for our folk, which emphasizes the importance of true cultural diversity and respect for all peoples. With that said, it seems odd to me that any of us would then turn around and challenge the progress of our movement by attacking any parallels to Christianity we may find in our research. While we do not want to mimic any of the domineering, oppressive dogma of the Church, we have to realize that we do share commonalities with some Christians in that we are all religious people. Like it or not, that will cause us to have similar ideas and goals at times, and we should never reject these based solely upon the idea that they embrace them as well. Personally, I blame the mainstream academia for much of this attitude. For so long they have been a major obstacle in restoring our birthright with the outright lies and misconceptions they have perpetuated about Odinism. They want to continue promoting the image of our ancestors as savage barbarians, incapable of things such as reverence, piety, or a strong moral system. They want to make Christianity the starting point for almost all of our traditions without even considering that the opposite is true – that many of their customs, in fact all of them that are not in the Bible, come from Odinism or some other Heathen European religion. We will skip over the obvious ones here, like Yule and Easter, and look to the two that really expose the bias of the academia. The first is the hlauttein (mentioned in Heimskringla [Hákonar Saga góða 14], Eyrbyggja Saga 4, and Kjalnesinga Saga 2), the evergreen twig we use to sprinkle the sacrificial liquids with. The academic scholars claim that this is but a mimic of the Catholic aspergilla, which is used to sprinkle holy water in baptism ceremonies. But where did the aspergilla come from? In Biblical writings, it is never mentioned, and Christian baptism is supposed to involve submersion in water, not the sprinkling of it. It is likely that the hlauttein is an ancient Indo-European traditions mentioned in the Rigveda (hymns I.XXII.3, I.CLVII.4) and Atharvaveda (IX.1) as the madhukasa, the Honey-Whip, or the Mead-Whip, which was used to “sprinkle the sacrifice” (Rig. I. XXII.3) and even the folk – “sprinkle us with your whip that drops with honeydew” (Rig.I.CLVII.4). Nothing is mentioned of what the whip was made of, and even though it is said to be a personification of the morning breeze, there is no doubt it could have had a mortal counterpart as a ceremonial tool, or that it was interpreted as such by our Odinist ancestors. His also justifies the modern use of sprinkling mead instead of blood in our blótar, as it seems that this was the most ancient use of the hlauttein or madhukasa. The second tradition is that of the “unknown god,” who is described in Völuspá 66 as the “great Godhead” who shall arrive after Ragnarok to “settle strife, sit in judgment, and lay down laws that will always last.” In Hyndluljóð 42 (Völuspá inn Skamma 14) he is mentioned again – “Then shall another come, even mightier, though I never dare to speak his name.” Of course, all of the mainstream scholars are unanimous in their declaration that this is the Christian god, interpolated into these sources by zealous scribes. But why would they be afraid to name him? You would think that, if they were indeed zealous, that they would have been more than willing to do so, especially when we see it done openly and thoroughly in some of these other ancient poems such as Sólarljóð. The fact is, there probably was an “unknown god” in the traditions of our ancestors. This could either be a new incarnation of Odin (as the “great Godhead”) after Ragnarok, or it could be Fate personified, who has the Norns as his agents. When the newly Christianized Anglo-Saxons wanted to give their new god a name in their native tongue, they called him Metod, a word identical to the Old Norse mjötu ðr, meaning “fate”. The Vedic Hindus also had an “unknown god”, who was called Ka, meaning “Who?”, and was given his own hymn in the Rigveda (X.CXXI). Here he is seen as a Godhead as well, and shares many attributes with Odin, for her created heaven and earth, and is the “giver of vital breath, of power and vigor” (verse 2, cp. Völuspá 17-18, Gylfaginning 9). It was easy for the academics to conclude that the god of Völuspá and Hyndluljóð is the Christian god, because they refuse to see our faith as one that reveres peace and order (even when these must be fought for), where we long for the next Golden Age when strife will be eliminated and our great Godhead shall “lay down laws that will always last”. The point of this is that we have to continue to move beyond this stale, secularist view of our religion fabricated by so-called scholars who want to discredit our ancestors at every turn. We have to begin to see ourselves as religious people, with a pious love for our Gods and Goddesses, with hope for the afterlife, and devotion to our way of life and our sacred laws. In my writings I had someone criticize me for using the concept of atonement because ‘that is a Christian idea’. This is nonsense because Christianity is based upon a foundation of fear and groveling for forgiveness, while atonement is heathen to its very core. Our relationship with the Gods and Goddesses is based on mutual respect, as adult children to their partners. In the above quoted Rigveda passages, the worshippers are not begging for forgiveness, they are making offerings to their Gods, then in the tradition of a gift for a gift, they are asking them to forgive their sins in exchange. This is atonement. Understand that if you in any way believe in an afterlife and religious laws that affect the afterlife, there has to be some way to make up for transgressions, otherwise one would be damned to Niflhel for any mistake. In other words, we would all be damned to Niflhel, because we are all going to make mistakes! We see forms of atonement take place throughout our lore. The most famous form is that of the weregild, which even the Gods once were asked to pay when they killed Gullveig-Heiðr: “Then the Powers all went to their Thing-seats, the high-holy Gods to consider thereon: if the Aesir should pay compensation, or if all the Gods should atone with gold.” (Völuspá 23). The fact is, in order for us to continue rebuilding our faith, we first have to do so in our hearts, and in our souls. There aren’t just some archaic traditions we are indulging in as some quant practice, they are embodiments of our very existences. They ring out in our blood, in our soil, and in our spirits. We have to break away the chains, all of them, to find what is right for our spiritual quest, so we can root out that which would keep us from reaching our maximum potential. There are some within the Odinist/Asatru movement as a whole who point out every parallel to Christianity as if it were some sort of blasphemy against our religion. That is a purely ill informed reactionary impulse. We are not Christians, but we are men and women of faith, we believe in an afterlife, in good versus evil, right versus wrong. We strive for the good and the right and hope to be judged as honorable by our beloved deities when we face them at the Helthing. We can continue to cross-reference our beliefs with those of the untainted Vedic Hindus, and we should, but most of all we need to fully understand the difference between our religion and those of the monotheistic cults. Then we can put a stop to knee-jerk reactions towards anything we create that may have similarities to their creeds. This will go a long way in truly accepting our faith for what it is, and will aid our great movement in its progression for years to come.